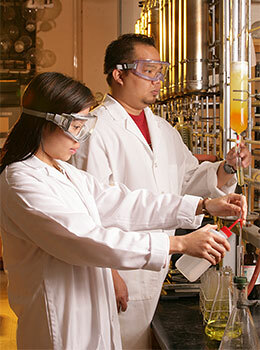 The Chemistry Excellence Fund allows the department to have a direct and immediate impact on UH undergraduate and graduate students, programs, and faculty that are not funded through state support. These funds can be used for faculty and student travel to conferences, research and undergraduate laboratory equipment, student-initiated seminars, and program support. We show our appreciation to our most talented undergraduate students by giving them departmental awards and scholarships. With this extra support, students can focus on their studies to reach their educational goals. 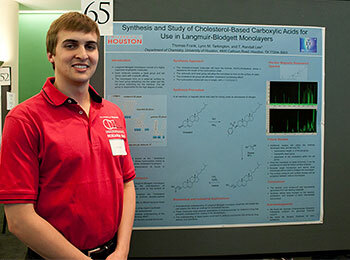 Graduate fellowships provide funds to doctoral students in the Department of Chemistry. Rewarding the top students with graduate fellowships or excellence awards allows us to recruit and retain high-achieving students — one of our Tier One Initiatives! These students are conducting research to solve real-world problems in the areas of health, energy, and the environment under the guidance of our world-class faculty. 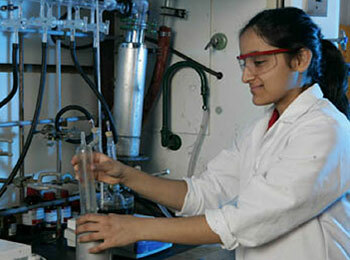 Faculty research is the foundation of a Tier One university, and the Department of Chemistry has many research stars. Ognjen Miljanic, assistant professor of chemistry, is the first UH faculty member to be recognized by the Research Corporation for Science Advancement (RCSA) as a Cottrell Scholar. He was selected for his innovative teaching methods and for his research to synthesize molecules with applications in environmental analysis, energy and chemical industry. Recently, Professor Olafs Daugulis received the Norman Hackerman Award from the Welch Foundation. This prestigious award recognizes him for his groundbreaking contributions to transition metal-based catalysis and potential to become an international leader in his field of research. We need your support to attract and retain research stars such as Professors Miljanic and Daugulis. Your research support allows faculty to pay for special items that are not funded through private and public grants or state funding, such as travel to professional conferences to report research findings, specialized research equipment or supplies, and research personnel. A gift to this area will help us make more discoveries and achieve more international recognition.